That was my general feeling after the success of J.J. Abrams’ Star Trek in 2009. The blockbuster was effectively the final nail in the coffin for the Star Trek that I had known and loved for so many years. And I enjoyed the movie. It was fun, with more elaborate effects than had ever been seen in any previous big screen Star Trek adventure. They’d captured the spirit of the characters and their relationships to one another. Repeated viewings, however, have left me feeling like the movie was actually a bit shallow. In many ways it simplified Star Trek, turning what was a dense, grounded reality into a Beverly Hills 90210-esque fantasy where kids fresh out of training are granted command of a starship, without a single bit of experience whatsoever. But regardless, the Gene Roddenberry/Rick Berman age of Star Trek (now affectionately called Star Trek Prime, or Star Trek 1.0) was over. However, the end of that period really started years before Abrams’ big screen bonanza. In fact, Star Trek started to die before it seemed to know it was dead. I’ve spent the last few weeks watching Star Trek Enterprise, the final series that was unceremoniously canceled after four seasons. Enterprise served as a prequel, charting the adventures of the first Starfleet vessel to go into deep space. Seeing it all again after so many years has been fun. The show itself was really much better than it got credit for at the time. But, like with anyone developing an illness, the symptoms were there. They started cropping up in the first season and were full-blown by the second. At the time of its collapse, the creative minds behind Star Trek insisted the disease killing the franchise was “Star Trek fatigue.” Audiences had simply grown tired of it all. The franchise needed a break after being on television in the form of four different shows (some of which ran concurrently in reruns) for nearly two decades (not including the years before when it was just Star Trek: The Original Series). On top of that were the films and the dozens of books each year. It was a convenient excuse – convenient because it took the blame off the creators. By pointing fingers at fatigue, they essentially blamed accountants at Paramount and the audience, deflecting away any responsibility for their own limitations. Fans as a whole, however, never really bought into this excuse. Now, having gone back to revisit Enterprise, I would say that there was perhaps some truth to the claims. 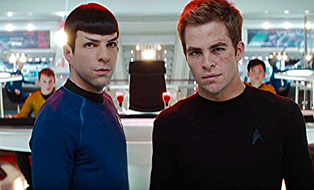 There was fatigue, but it was the formula that was growing tired, not Star Trek itself. Keep in mind that genre television had changed dramatically during the 1990s and 2000s. It had become more serialized, thanks in large part to The X-Files, as well as Stargate SG1 and Buffy the Vampire Slayer. The shows were more sophisticated, with long story arcs and richer backstories (the phrase “series mythology” was born). Star Trek, however, was very slow to adapt to this change. The powers that be were sluggish to recognize what audiences wanted in their shows. Instead, Trek stayed the same. 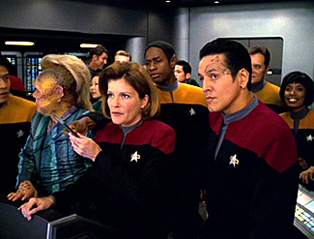 Star Trek: Voyager continued to rely solely on the planet/alien/anomaly-of-the-week formula. This was a tried-and-true approach that dated back to the original series and in many ways was good. But at this point it had become overly used, aged and repetitive. Star Trek: Deep Space Nine proved the franchise could adapt, but that series was – especially at the time and often by the very people in charge – viewed as the black sheep of the family. 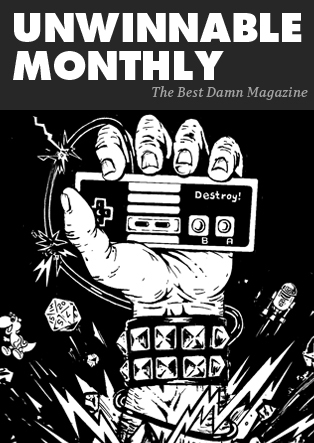 An anomaly. A series that was dark and brooding and serialized, all things syndicators (the people the producers were apparently forced to appeal to) supposedly didn’t like. Star Trek: Voyager stayed true to this traditional formula. 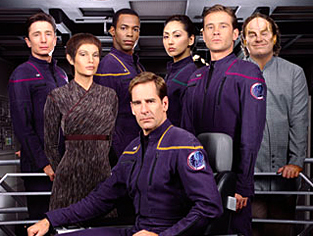 Enterprise would follow suit, most especially in its first two seasons. The fledgling series tried to have a mythology in the form of a Temporal Cold War, but it was handled so poorly and half-heartedly it never really worked (and was eventually dropped altogether at the beginning of the fourth and final season). Both series relied heavily upon the formula, which didn’t just include the stories. The look, style and feel remained consistent as well. Each show had a set number of characters (with the shows often focusing only on a few, and rarely on the others), and were set on a ship often going randomly through space. As a result, the characters became meaningless and the plots felt familiar. Virtually any episode in the second season of Enterprise could have been used in The Next Generation and would not have been much different. By 2004, fans had grown tired. The show was criticized, the writers were demonized and the blame game began. “Star Trek fatigue” was killing the franchise, the producers cried. Even the book publishers started pumping out fewer novels. But this was only half true. “Star Trek formula fatigue” was killing it, and the writers who had spent too many years churning out Trek like it was a product and not a creative endeavor were to blame. Star Trek: Nemesis, the final classic Trek film, debuted in 2002 and was spit out as the last entry in the film series. Like the shows, the movies suffered formulaic fatigue, crunching out one film after another that made little use of its cast and instead repeatedly focused on just two characters (Picard and Data). Both with Enterprise and Nemesis, fans were promised a new kind of Trek. Something different. Yet despite the best intentions, what they got was more of the same formula. The year 2005 marked the “end” of Star Trek. The franchise that Gene Roddenberry had created, that Rick Berman had steered, was done. All good things came to an end. But we all know that death in Star Trek means little. A new Star Trek movie will hit theaters next year, and a new series is inevitable. But hopefully we’ll actually get a Trek that has learned the lessons of the past and won’t be doomed by repeating them.